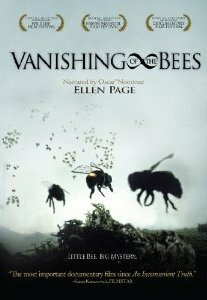 The documentary follows the mystery of that was killing bees suddenly and in huge numbers. It turned out the French had figured it out a decade earlier. Bayer (the Aspirin people) marketed two systemic pesticides Gaucho and Poncho. System poison get inside the plant and stay there its entire life, making every part of the plant, including the nectar and pollen poisonous. Bayer had tested them only for death within 3 days. It turns out they kill by gradual buildup. Immature bees in contaminated pollen brought back to the hive. Adult bees are poisoned when the turn to eating stored pollen when the weather turns cold. This is not just a tree-hugger tragedy. Bees are needed for all manner of crops from apples to blueberries. The wild bees are all but extinct and the domesticated ones are on the ropes. Even later thinking blames a parasitic mite. Pesticides lower resistance.